Accra, Jan 17 (LENS) -- None of Mr. Kufuor's Ministerial nominees has attracted as much attention as Mr. Yaw Osafo Maafo, who was recently falsely touted as the best Finance Minister in Africa. He has been removed from the Finance Ministry and pencilled in for the job of Minister for Education and Sports. 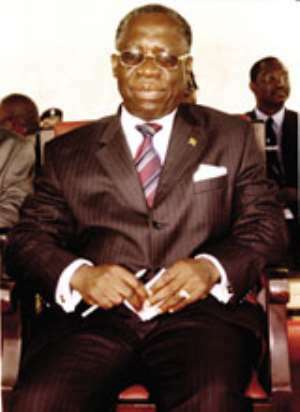 While opponents of the NPP and individuals who do not have any reason to like Osafo Maafo were quick to deride his removal from the Finance Ministry to the Education and Sports Ministry as a demotion, supporters and apologists of the government have been working in overdrive to prove that the nomination was not a demotion. However NPP insiders close to certain individuals who have their eyes on the next Presidential elections, say the apparent demotion is actually a move to better position Osafo Maafo to have a huge advantage over any other person with an eye on the 2008 elections. This appointment, the insiders argue, is a clear indication that Mr. Kufuor is playing for Osafo Maafo to succeed him come 2008. According to them the conventional wisdom in the NPP is that the party cannot put forward another Ashanti for the next Presidential elections, yet the party would not like to lose its Akan appeal which really rescued their flagging fortunes in the 2004 elections. This will effectively rule out an Aliu Mahama card. Of the three strongest contenders in contention, being Nana Akuffo Addo, Hackman Owusu Agyemang, and Nana Yaw Osafo Maafo, all of them Akyems, Mr. Kufuor has effectively dealt with whatever threat Nana Akuffo Addo may pose to the presidential ambitions of his choice for the job, Osafo Maafo, by keeping him at the Foreign Ministry where his duties would keep him out of touch with the grassroots of the party as well as the ordinary people of this country. Hackman Owusu Agyemang on the other hand has been moved from the powerful Interior Ministry to the Ministry of Works and Housing to cool off. By moving Osafo Maafo to the Education Ministry at the time that a new education reform is about to take off, which translates into a bigger budget for the Education side alone of his dual ministry, Mr. Kufuor is presenting Osafo Maafo with a ready platform to remain in the public eye. Again, with HIPC almost synonymous with Osafo Maafo, the nominee seems to have been presented with a platform that enables him to commission school projects funded with "HIPC benefits"; with this, Osafo Maafo is expected to come out smelling like a bed of roses. Additionally, in the event that Ghana qualifies for its first World Cup appearance, Osafo Maafo's image and chances would be greatly enhanced when that dream finally becomes a reality. However, should Ghana fail to qualify Osafo Maafo could not be blamed for the failure, having just been moved to that Ministry. But more importantly, the Sports side of his Ministry is also expected to see a huge increase in its budget in the coming years as Ghana prepares to host the 2008 African Cup of Nations. A lot of avenue to make much needed money to push his candidature at an NPP congress that is expected to be like all other previous NPP primaries, where money is the deciding factor. Nobody in the NPP could be expected to outshine Osafo Maafo if he makes a success of our right to host that tournament, and more importantly if Ghana emerges victorious at the tournament. In that event, having been credited for single-handedly achieving macro-economic stability, the NPP could hardly find another more easily marketable candidate. Mr. Kufuor's support for Osafo Maafo is said to be his big pay back for favours that Osafo Maafo did for Mr. Kufuor when he used his position as the boss at the National Investment Bank to write off as bad debt loans Mr. Kufuor had contracted in the name of his company. Observers say having been the Finance Minister in the first term of the Kufuor administration, Osafo Maafo knows where a few of the bodies are buried, and he may have used that knowledge as a leverage to secure Mr. Kufuor's support for his presidential ambitions. But analysts are quick to point out that with increasing increases in Residential Facility User Fees at the tertiary level, and increases in school fees in general, coupled with other problems in the Educational Sector, it would be a miracle if Osafo Maafo comes out smelling of roses.